The finest cruising experience yet imagined, NENNE (a Swedish name which means strong and brave like a lion), elevates the enjoyment of a floating holiday to new heights. 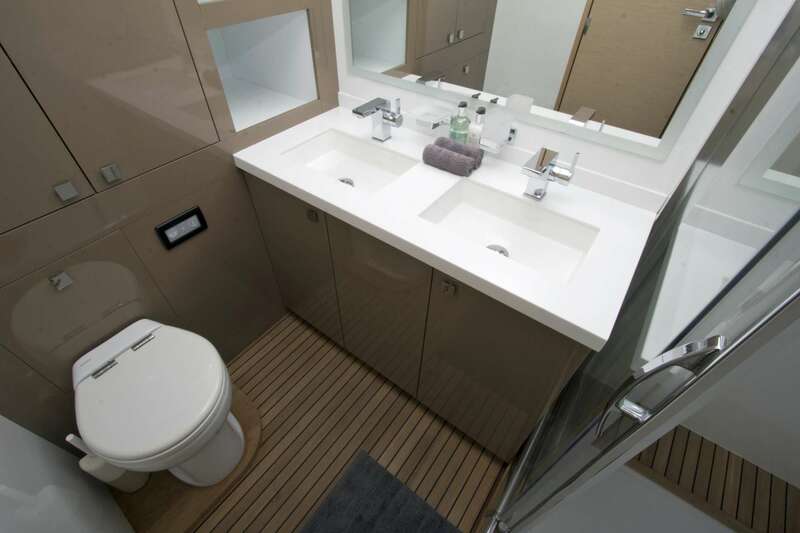 A Victoria 67, newly built and launched in 2017, she's the newest addition to Fountaine Pajot's Flagship fleet, their top-of-the-line luxury cruising cats. She's sleek, elegant, and extremely spacious with an overall length of 67 feet and beam of 31 feet; truly, the ultimate in cruising comfort. The popular flybridge concept has been expanded on this yacht to a state nothing short of magnificence. It is accessed from the cockpit with stairs on both sides that are highly secure. The 2-person carbon fibre helm, offset to starboard, provides the captain excellent visibility and easy access to winches, sheets, sails and traveler to ease the work of sailing. 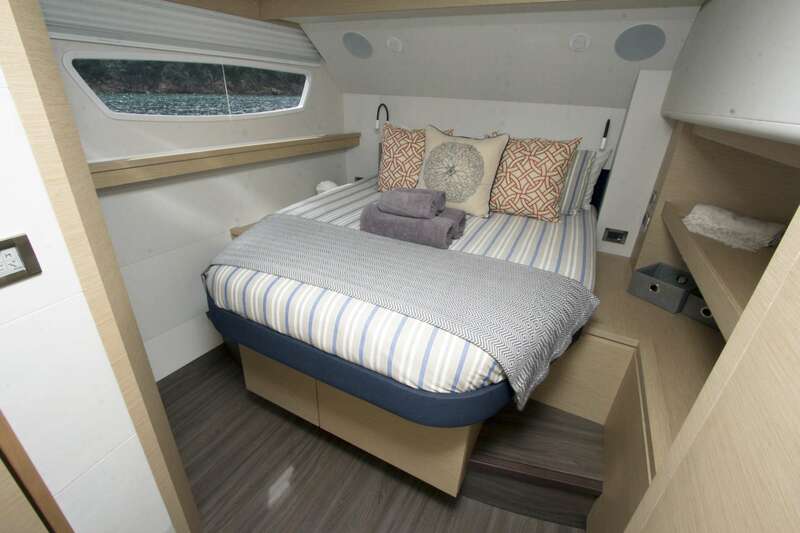 For guests aboard who have come to relax, the seating area is incredibly comfortable with benches, side tables, a relaxing sofa, and the convenience of a refrigerator and sink. The rise & fall tables can also be used for dining, making this a highly usable area not usually found on an FP 67. A large bimini provides an area of escape from the sun for those who want some shade and there is integrated lighting for evening cocktails. Additional side and rear covers can be used to block the wind for dining if desired, and of course, the large double lounge cushion for sun bathing make this a highly desirable space for the ultimate in relaxation, all enjoyed with awesome views of the surrounding scenery. 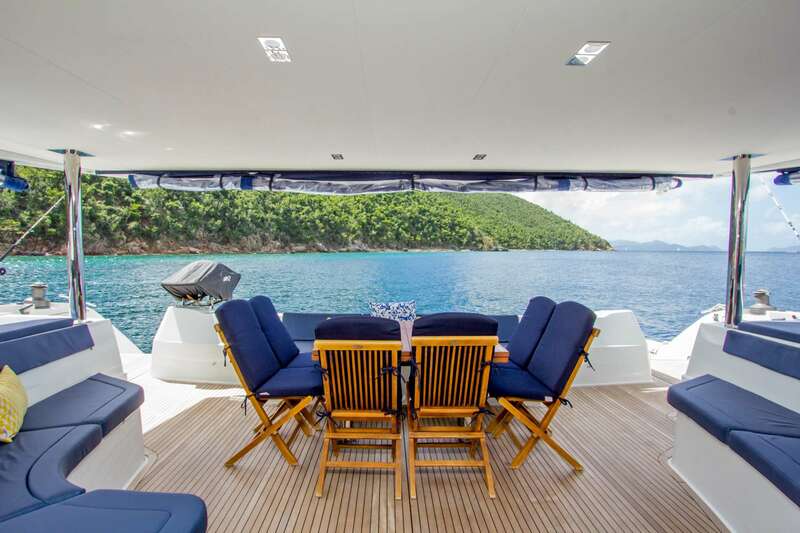 The large aft deck is shaded by the flybridge overhead and provides additional comfortable lounging spaces, as well as an elegant setting for formal dining. Two large sumptuous pads are optimal for relaxing. A projector and large cinema screen can be viewed inside from the cockpit or saloon. Step into the saloon which features urban chic decor with gorgeous leather upholstery, and lots of space for comfortable entertaining in air-conditioned comfort if so desired. 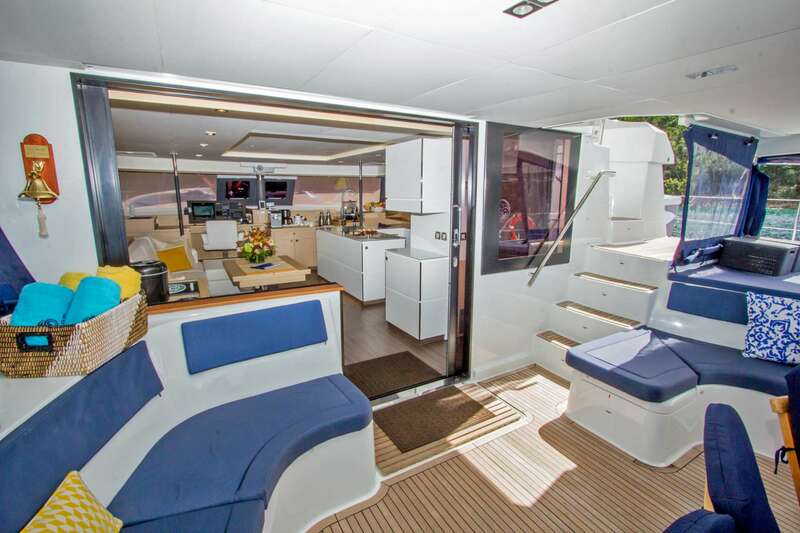 The large relaxing seating area has an electric rise and fall coffee / dining table providing an additional option. The open galley is equipped with state of the art appliances, fine china, and extensive glassware. There is an extra chart plotter and helm station at the chart table from where the boat can be steered. Accommodation for 10 guests in 5 cabins which are all en-suite: 1 King, 3 Queens, and 1 Twin which can be configured to a King upon request. 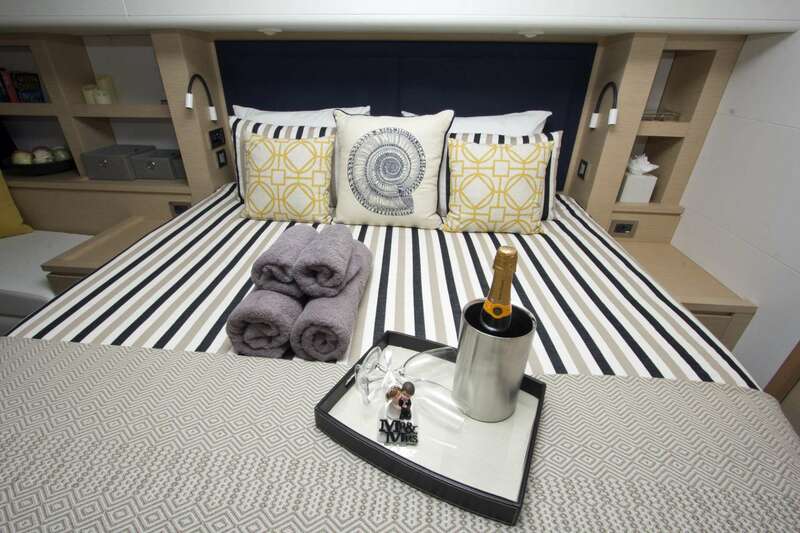 Each cabin has independent A/C, Sony and Apple flatscreen LED TV with access to onboard server film library with over 500 films, Bose hifi music system, high quality bed linens and and towel sets including nice thick NENNE-branded beach towels. 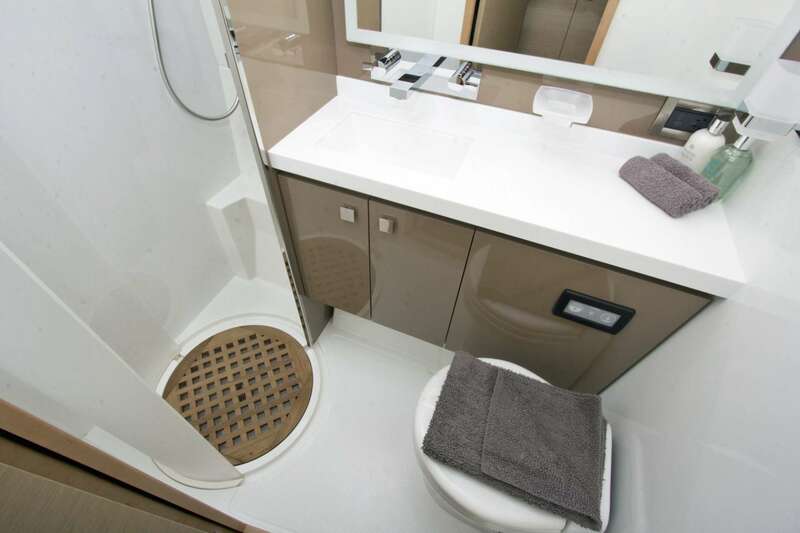 The very large master cabin has a desk/dressing table and a comfortable couch. The only way to improve on such a fabulous yacht is with an outstanding crew and NENNE delivers there too. Captain & Chef Donald and Audrey Harper have established themselves as one of the top crews in the Caribbean charter market, evidenced by 16 charter yacht show awards in categories including Best of Show, Culinary, Table-setting, and ECO-friendly. The most important accolade this crew receives on a regular basis is numerous rave reviews from their guests. 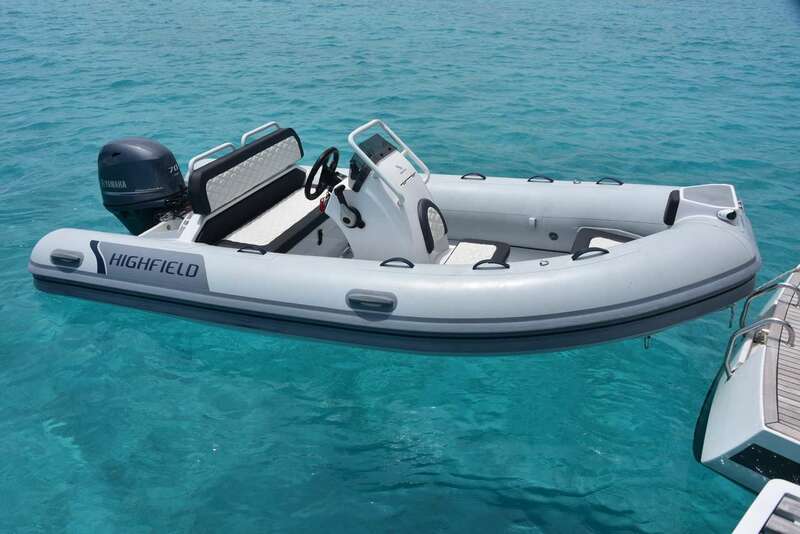 NENNE is equipped with a large array of water toys including, snorkel gear, kayaks, stand-up paddleboards, wakeboard, adult and children's waterskis, a range of towable inflatables, plus a 100hp tender for towing. For guests interested in scuba diving, you won't find a better choice than NENNE as she offers a premium dive experience with a complete assortment of top-of-the-line equipment, an onboard dive compressor. (See specs for details.) Captain Donald is a licensed PADI Dive Instructor and loves to share his passion for diving and favorite local dive spots with guests. Accommodation for 10 guests, in 5 cabins which are all en-suite: 1 King, 3 Queens, 1 Twin. Upon request the Twin can be configured to King. All have independently controlled AC, Sony TV and Apple TV with access to onboard server film library with over 500 films and Bose hifi music system. 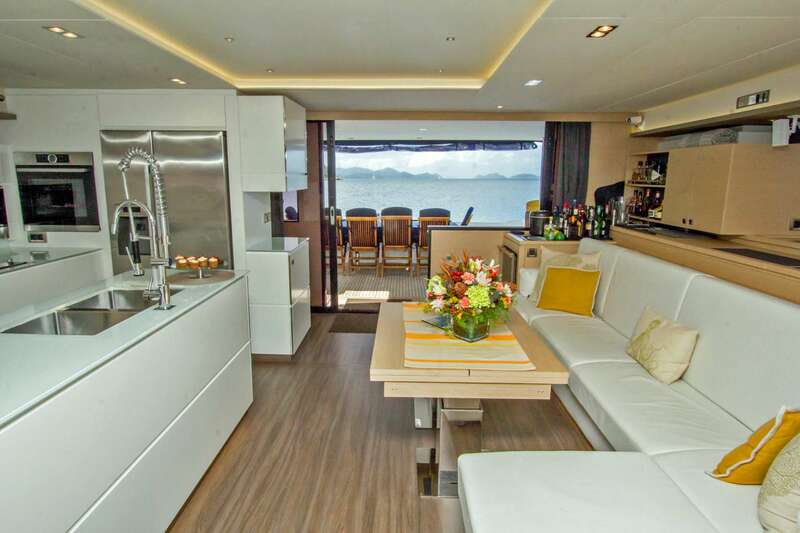 The very large master cabin has a desk/dressing table and a comfortable couch. Toiletries are provided and Nenne has sunblock on board, but ask clients to bring their own sunblock that agrees with their skin (Nenne provides a guideline in a Helpful Hints guide prior to the charter).